Let our PROFESSIONAL VOICE TALENT be the voice of your business! GET A QUOTE NOW! Pricing starts at just $75! Impress Customers! Enhance your business image and build instant credibility with Professional Business Voicemail Greetings – Auto Attendant Recordings – IVR Voice Prompts – IVRS Voice Recordings – On-Hold Messages – PBX, VOIP, Cloud phone recordings, Automated Receptionist & Answering Service recordings …by Macryn Voice Greetings. 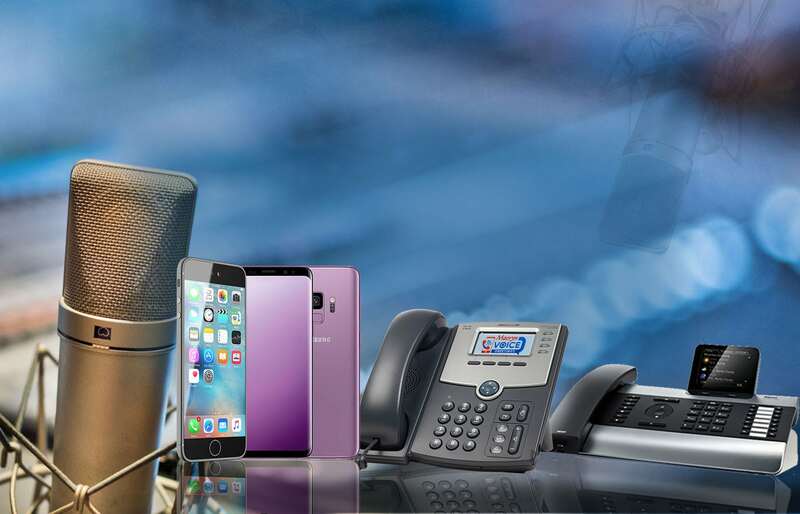 We provide custom phone greetings & recordings for all types of Telephone Systems, Office Phones and Business CELL PHONES/MOBILE PHONES for low, affordable pricing! GET YOUR PRICE TODAY! We specialize in Interactive Voice Response (IVR) Voice Recordings, IVRS and Auto Attendant messages for all types of businesses, industries and IVR Developers. High quality, crisp, clean phone recordings produced in a broadcast quality recording studio. Serving Small Business Owners & Large Companies in the U.S.A, Canada & Worldwide! We’ll take care of just one simple office voice mail greeting…or hundreds of IVR Voice Prompts and Auto Attendant recordings. Affordable pricing! FAST, friendly and reliable service! Ask about SAME DAY SERVICE! RingCentral ♦ Grasshopper ♦ Vonage ♦ 8X8 ♦ Mitel ♦ Verizon ♦ AT&T ♦ Jive ♦ Ooma ♦ Comcast ♦ Xfinity ♦ FreedomVoice ♦ GoDaddy Smartline ♦ Avaya ♦ Cisco ♦ Shoretel ♦ Panasonic ♦ Megapath ♦ Cisco ♦ Virtual PBX ♦ T-Mobile ♦ Galaxy ♦ CallCentric ♦ Fonality ♦ Quantum Voice ♦ Alliance ♦ Broadvoice ♦ Speakeasy ♦ DingoTel ♦ Gizmo ♦ Onsip ♦ WOW ♦ OneBox ♦ Nextiva ♦ ATT ♦ VoiceShot ..and many more! Apple iPhone Samsung Android Motorola Blackberry, etc…. 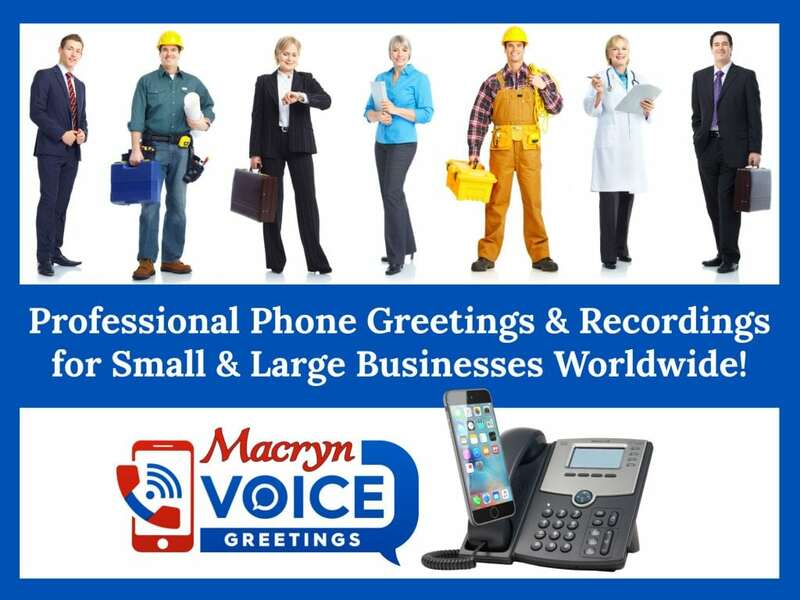 You can trust Macryn Voice Greetings to provide you with the highest quality voice recordings for your business phones and mobile phone. Our Professional Voice Talent has provided voice recordings for some of the largest companies in the world! Auto Dealers, Restaurants, Dental Offices, Doctors, Attorneys, Technical and Engineering Companies, Locksmiths, Government Offices, Salons, Retail Stores, Cleaning Services, Real Estate Agents, Insurance Companies, Transportation Companies, Marketing Firms, Hospitals, Schools, Travel Agents, Furniture Stores, Catering Services, Manufacturing Firms, Financial Advisors….and countless others. Need any other Voice Recordings or Narration Services? We can also provide you with Voice-Overs and Narration services for Commercials, E-Learning, Training Tutorials, Product Demos, Explainer Video Voiceovers, Corporate Narrations and much more through our parent company, Lecia Macryn Voice Services. Need Other Languages? We can provide: American English, Spanish, French, French-Canadian, British and more. Just ask! Commercials, E-Learning, Training Narrations, Multimedia & Powerpoint, Web-based Training Narrations, Podcasts, Product Demos, Corporate Presentations…and much more! Detroit, Michigan, Chicago, Illinois, New York, California, New Jersey, Ohio, Dallas, Houston, Austin, El Paso, San Antonio, Texas, Miami, Florida, Utah, Los Angeles, San Jose, Cupertino, California, New Jersey, New York, Chicago, San Diego, Atlanta, Georgia, Phoenix, Arizona, San Francisco, Alabama, Philadelphia, Pennsylvania, Nashville, Tennessee, North Carolina, South Carolina, Virginia, Missouri, Minnesota, Oregon, Nevada, Las Vegas, New Mexico, Washington, Maryland, Maine, Hawaii, Alaska, Colorado, Kansas, Wyoming, Arkansas, Indiana, Kentucky, Rhode Island, West Virginia, Massachusetts, New Hampshire, Vermont, Connecticut…plus many more!